Lot 194. 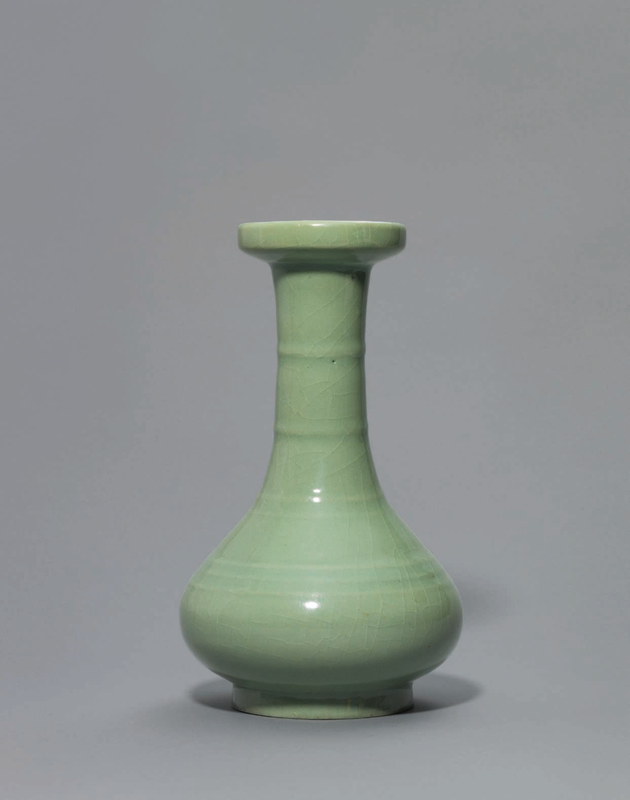 A 'Longquan' Celadon-glazed 'Bamboo-Neck' Vase, xianwenping, Southern Song-Yuan Dynasty (1127-1368); 10 3/8 in. (26.5 cm.) high. Estimate GBP 20,000 - GBP 30,000. Price realised GBP 25,000. © Christie's Images Ltd 2018. The compressed pear-shaped body is subtly decorated with a series of low horizontal bands, and the tall tapering neck is encircled by two bow-string bands in imitation of bamboo, all below a wide slightly inverted galleried rim. The vase is covered overall with an unctuous crackled pale green glaze. Provenance: Private collection, Kanazawa, Japan, acquired in the early 20th century. Christie's New York, 15-16 March 2015, lot 3250. 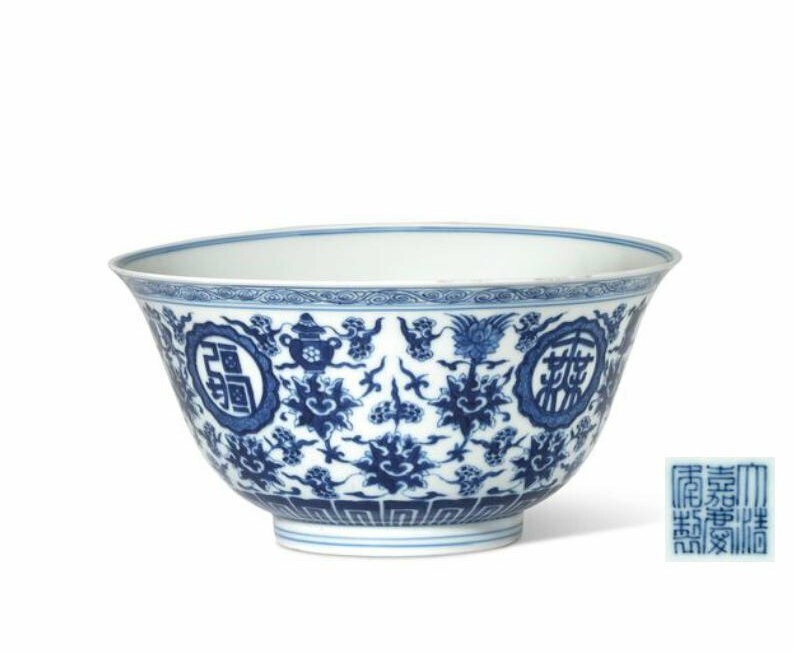 Note: Vases of this form, called xianwenping ('string pattern vase'), are potted with two different types of mouth rim, either a wide dish-shaped mouth or a slighted inverted galleried rim. The present vase falls into the latter category. 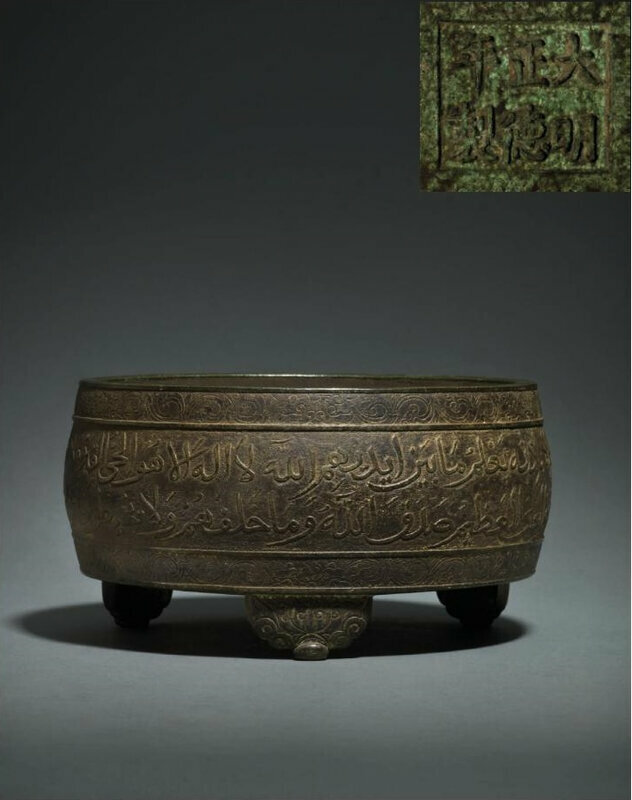 Compare with a vase in the Nezu Museum in Tokyo illustrated in Sekai toji zenshu, vol. 12, Tokyo, 1977, no. 81, and another in the Percival David Foundation of Chinese Art in London published in Margaret Medley's Illustrated Catalogue of Celadon Wares, London, 1977, pl. V, no. 50. These two types of mouth rims were contemporaneous, as evidenced by the finds from a Southern Song hoard excavated at Jinyucun, Suining City, Sichuan province in 1991, and from Longquan kilns sites. Vases from the former site are published in Newly Discovered Southern Song Ceramics - A Thirteenth-Century "Time Capsule", Japan, 1998, pp. 14-16, nos. 2-4, and from the latter in Longquan Qingci Yanjiu, Beijing, 1989, pl. 41, fig. 1. These vases were also among the cargo of a wreck dating to 1323 which sunk off the Sinan coast of Korea on its way to Japan. See National Museum of Korea, Sinan Wreck Exhibition, Seoul, 1977, no. 15.